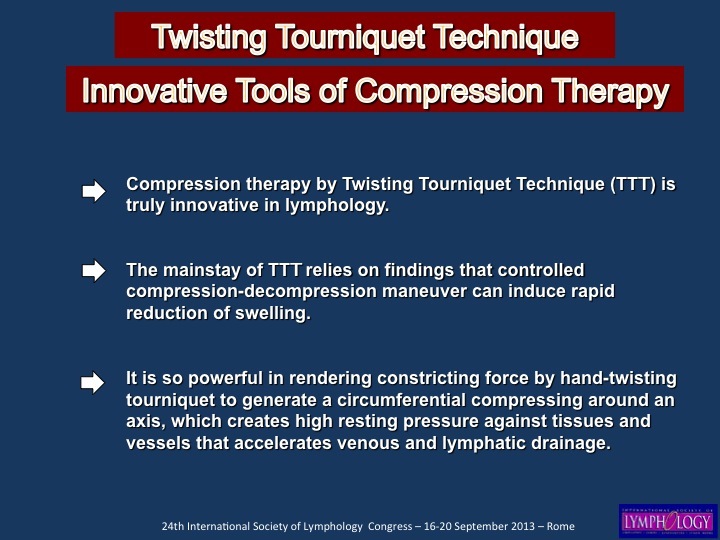 Background Compression therapy by Twisting Tourniquet Decongestive Technique (TTD) is truly innovative in lymphology. 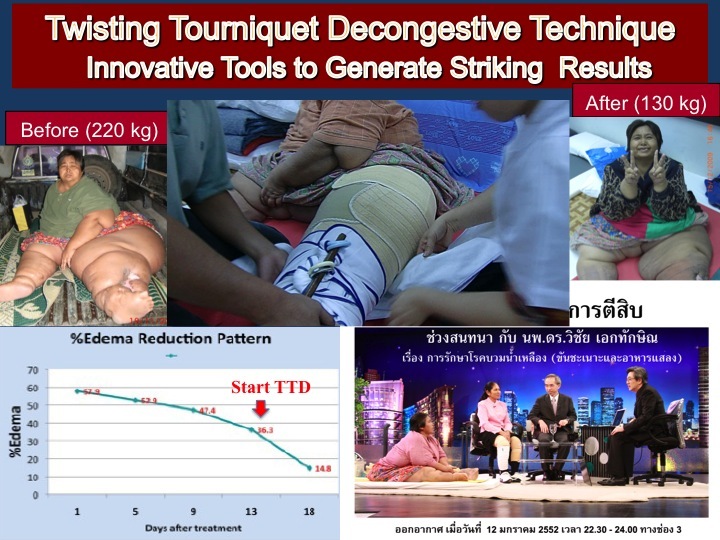 TTD was designed, tested, and continually modified and test-driven, so that the most practical form was accomplished in 2006. 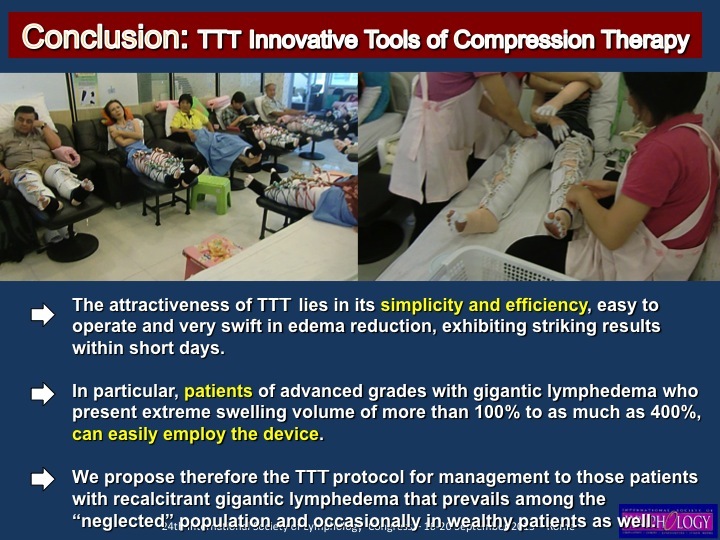 The mainstay of TTD relies on findings that controlled compression-decompression maneuver can induce rapid reduction of swelling. 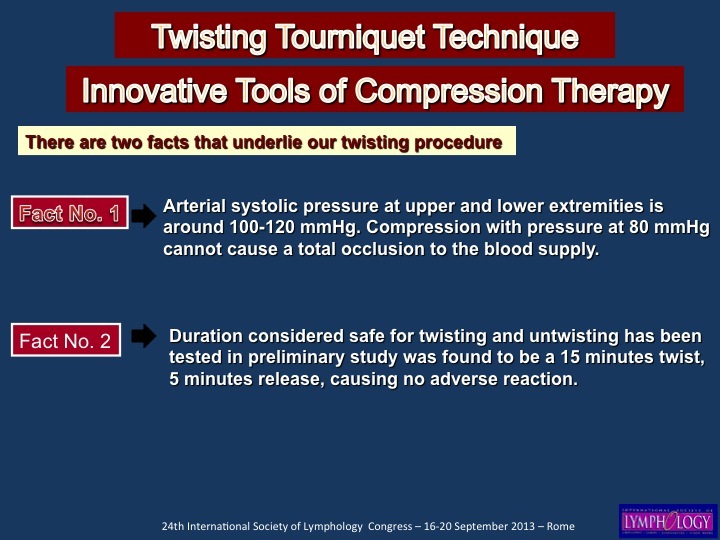 We found out in the course of study that the combination of 15-min twist followed by 5-min untwist, continually 10-20 sessions a day, generates maximal results. 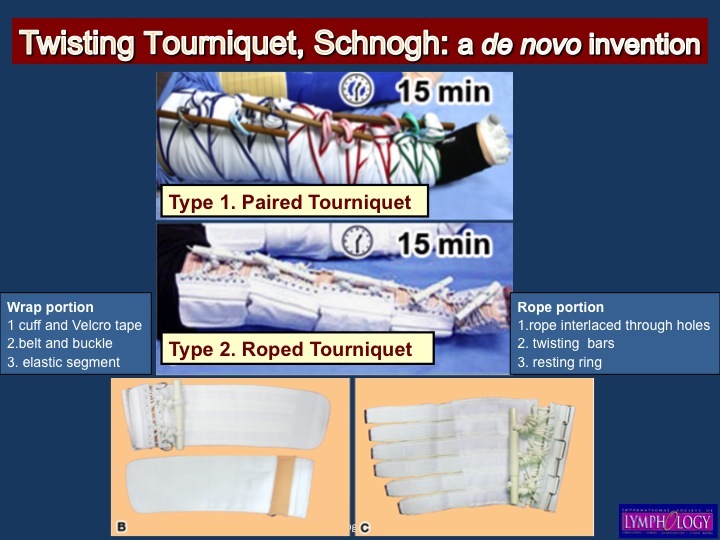 Itis so powerful in rendering constricting force by hand-twisting Schnogh to generate a circumferential compressing around an axis, which creates high resting pressure against tissues and vessels that accelerates venous and lymphatic drainage. 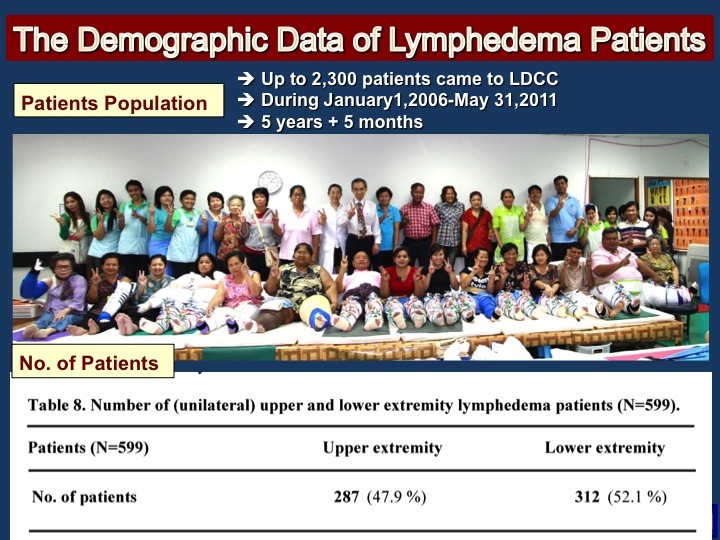 Materials and Methods From 3,000 patients who underwent TTD for 5 days, we reported here a large number of 599 having passed inclusion criteria; 287 were of upper and 312 of lower extremity lymphedema, respectively. 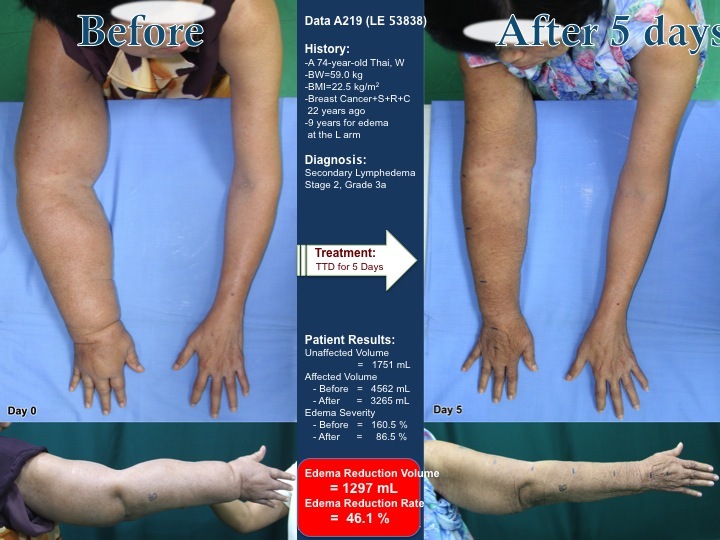 Results and Discussion For upper extremities, the average edema severity before and after course treament was 63.7 and 34.3%, respectively. 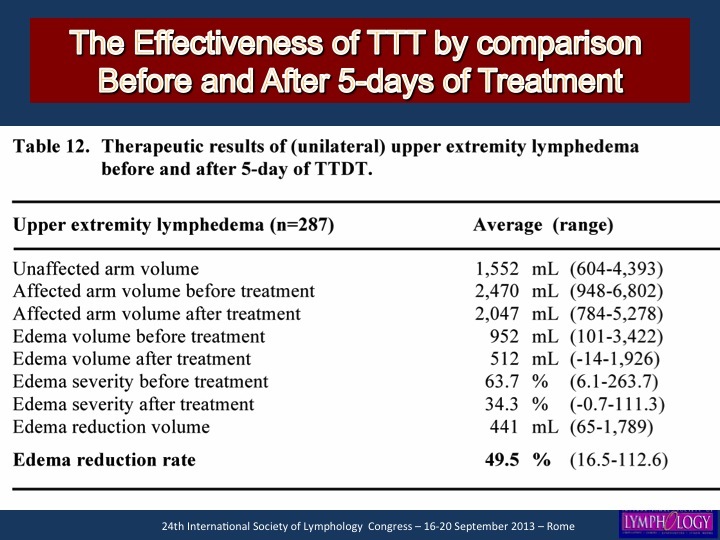 For lower extremities, the average edema severity before and after TTD course was 62.2 and 31.6%, respectively. 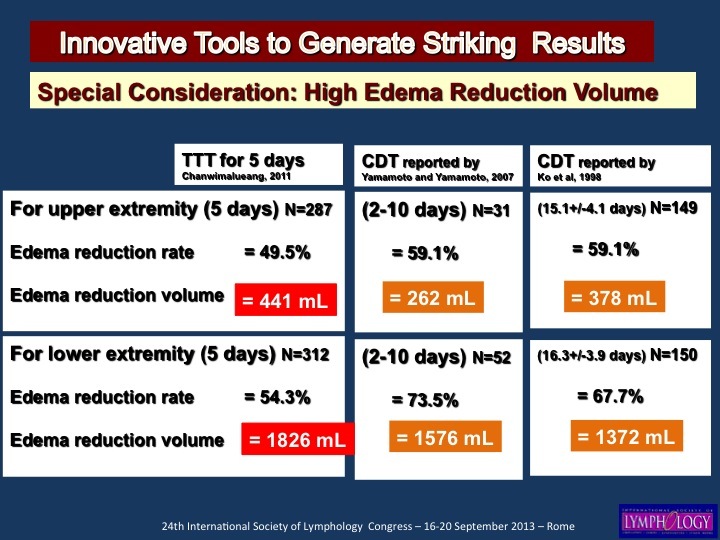 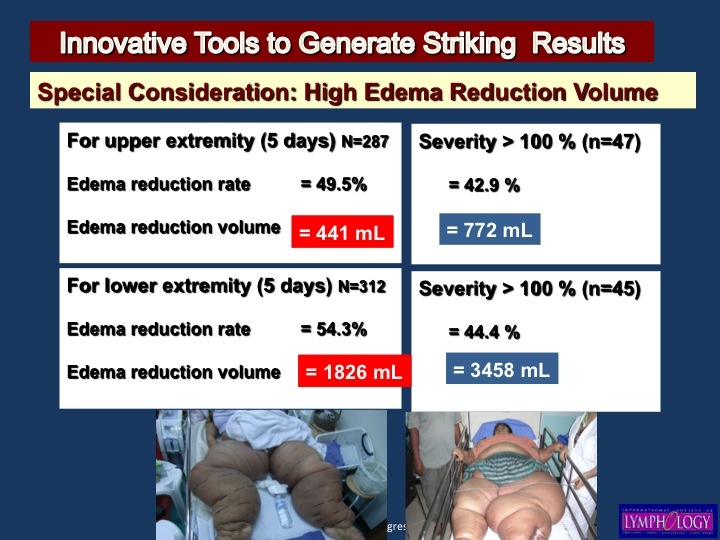 TTD exhibited an average edema reduction rate at 49.5% and 54.3% that translated into edema reduction volume at 441 mL (range 65~1,789 mL) and 1,826 mL (227~9,191 ml), respectively. 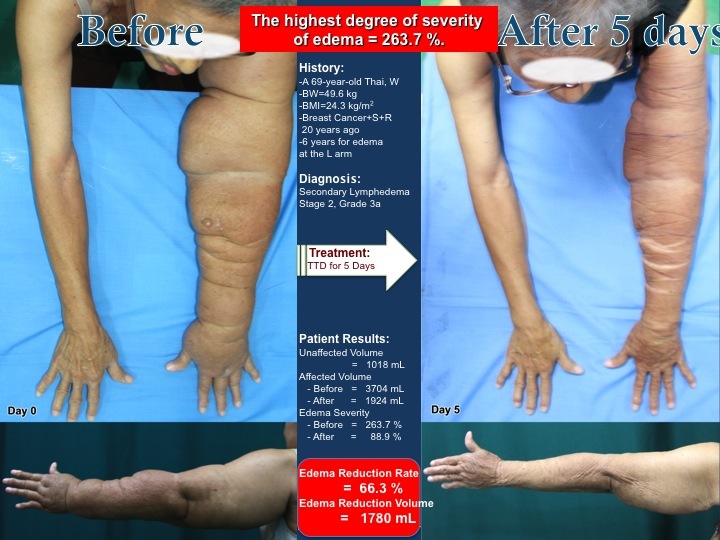 We had 47 patients in 287 cases of upper extremity and 47 patients in 312 cases of lower extremity who suffered from gigantic grade (edema severity 100~300+%) of swelling. 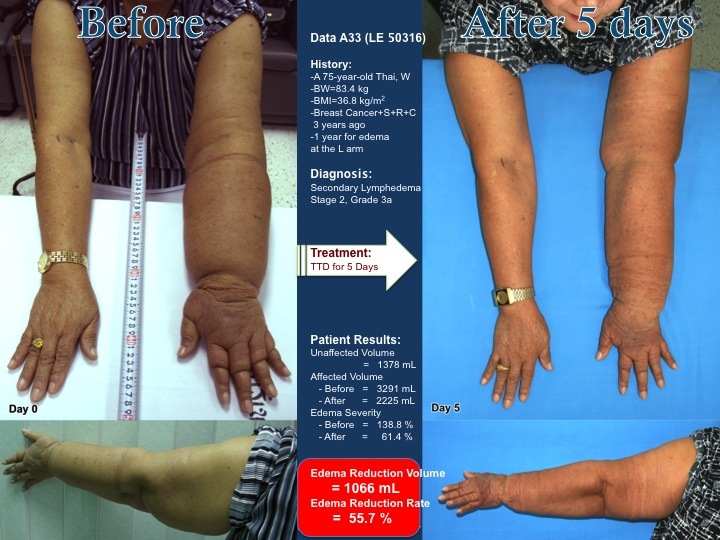 The largest arm in our sires was 263.7% swelling, and the largest lower limb was 368.9% swelling. 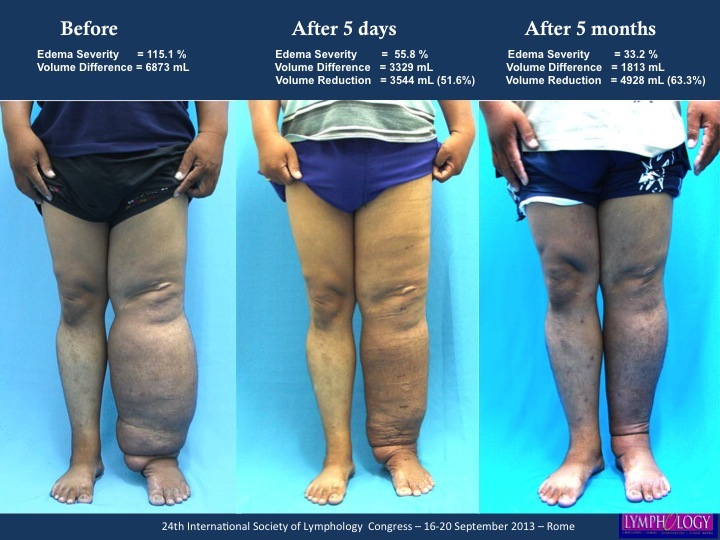 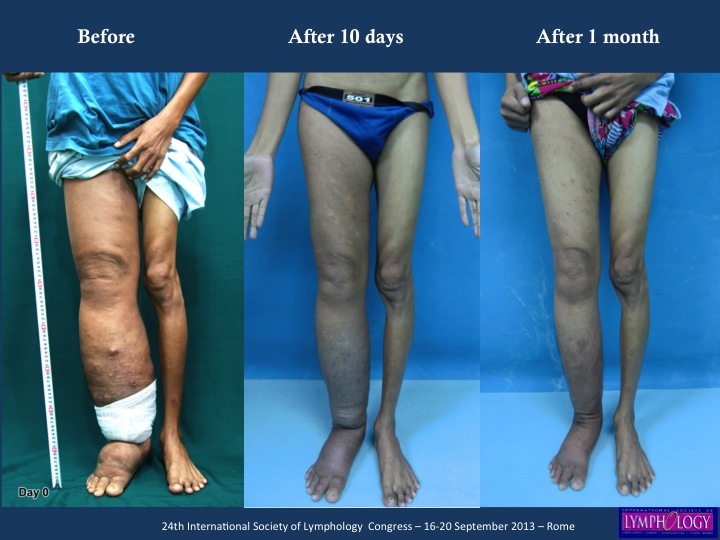 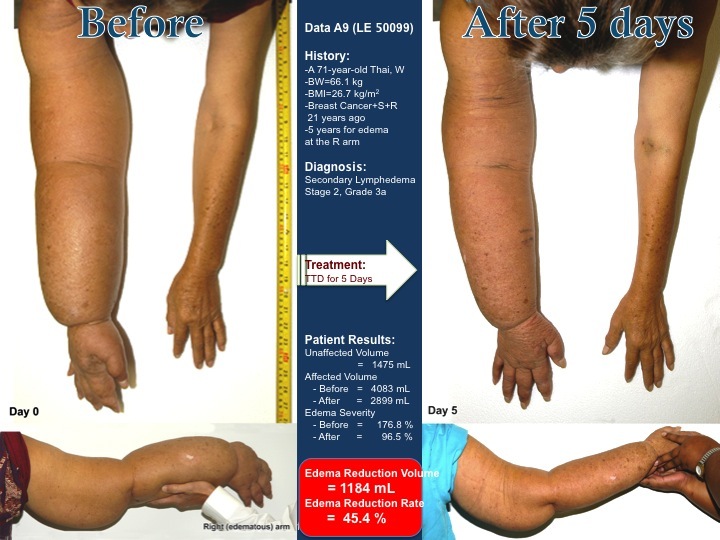 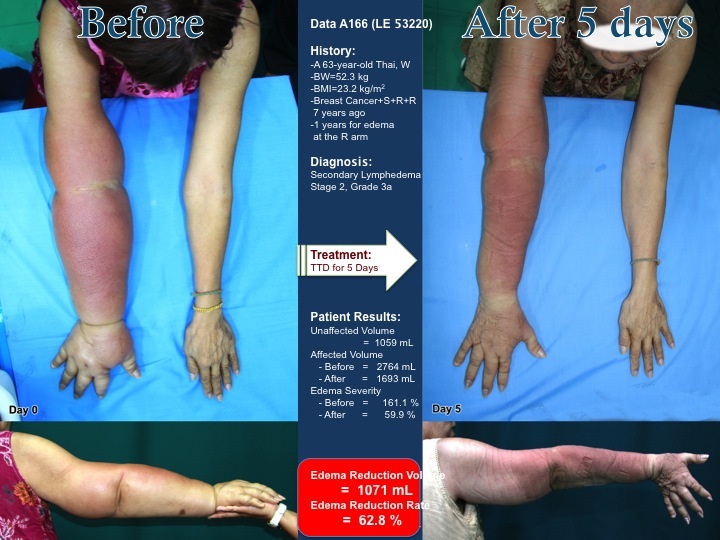 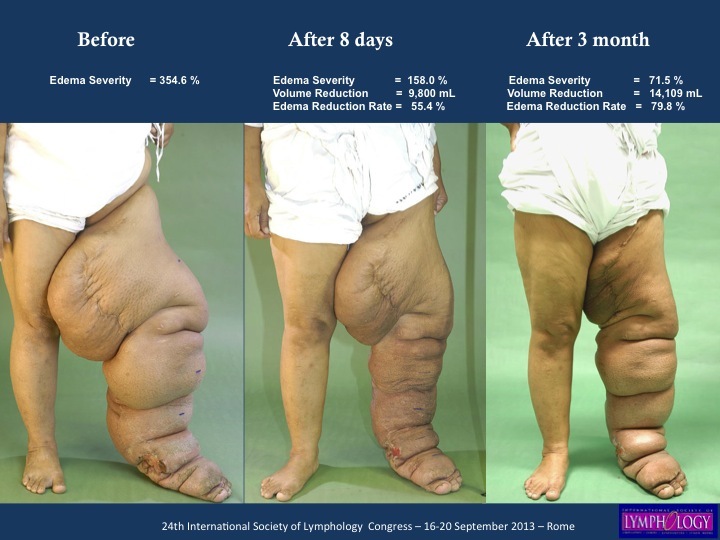 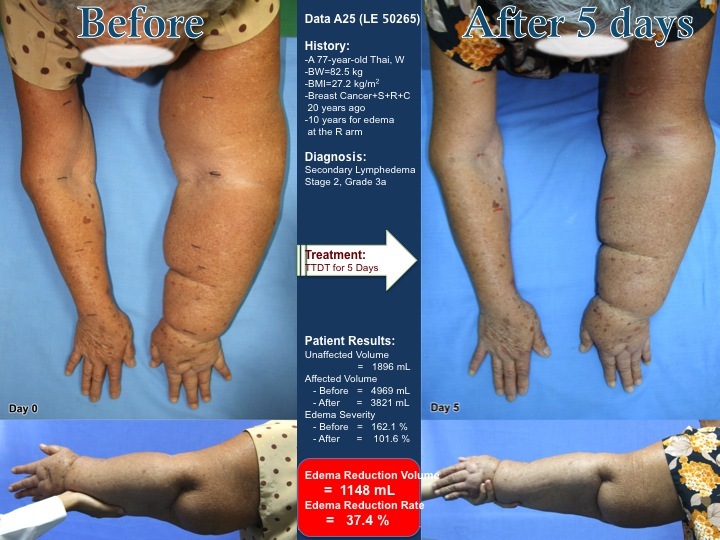 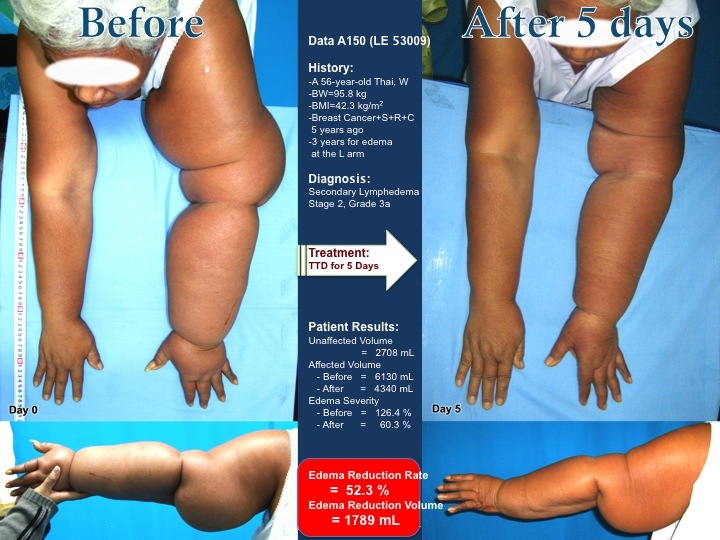 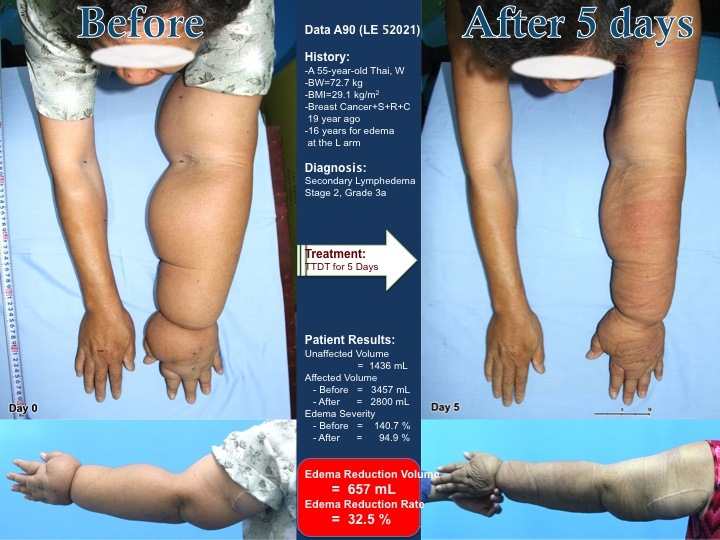 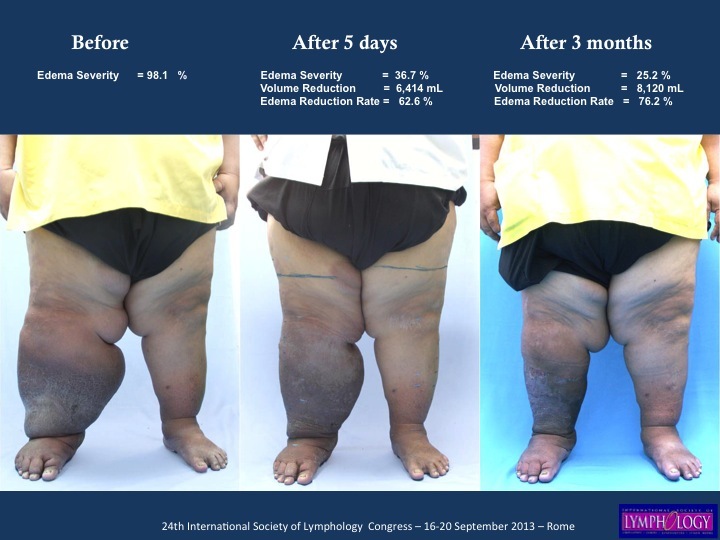 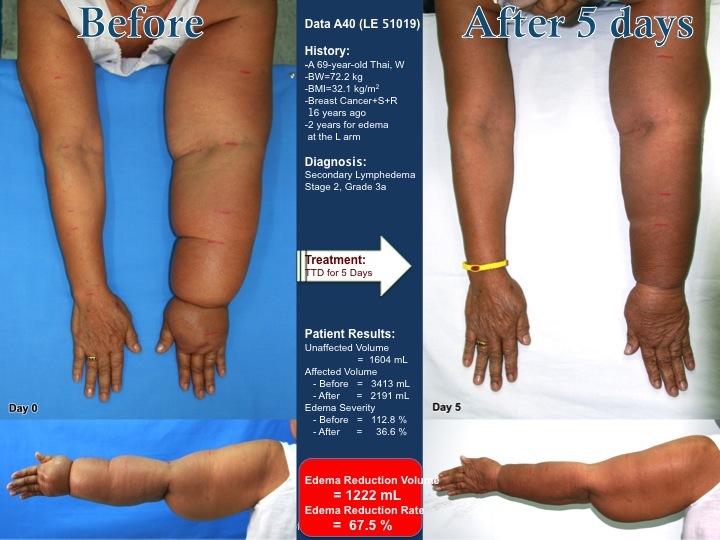 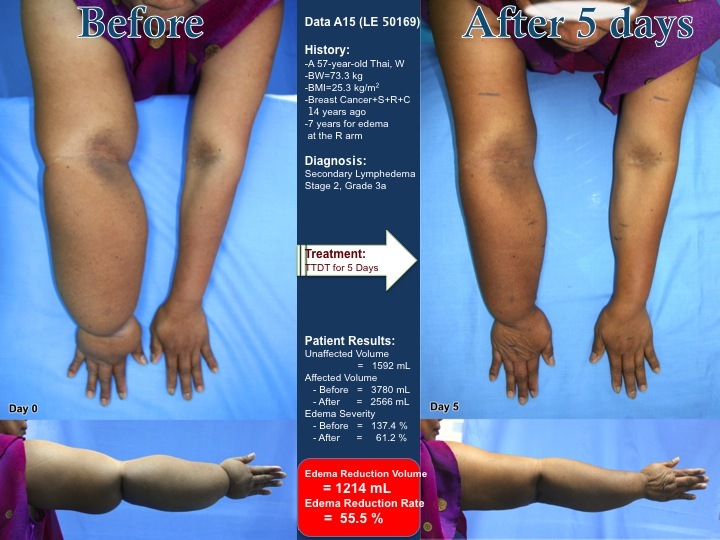 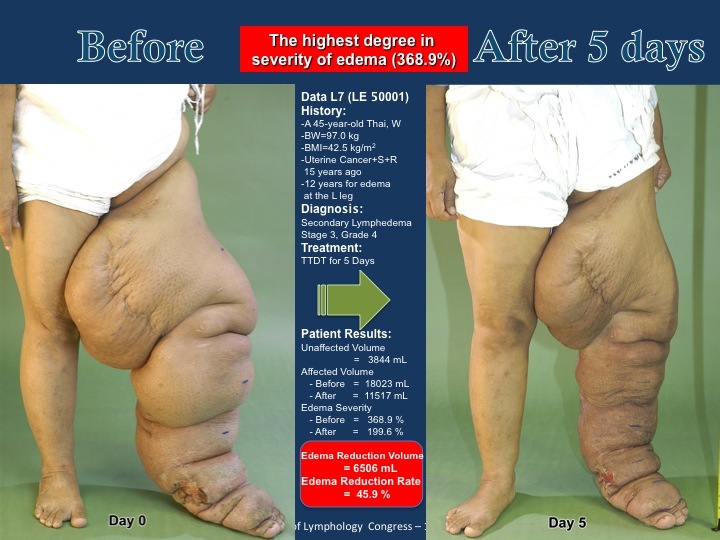 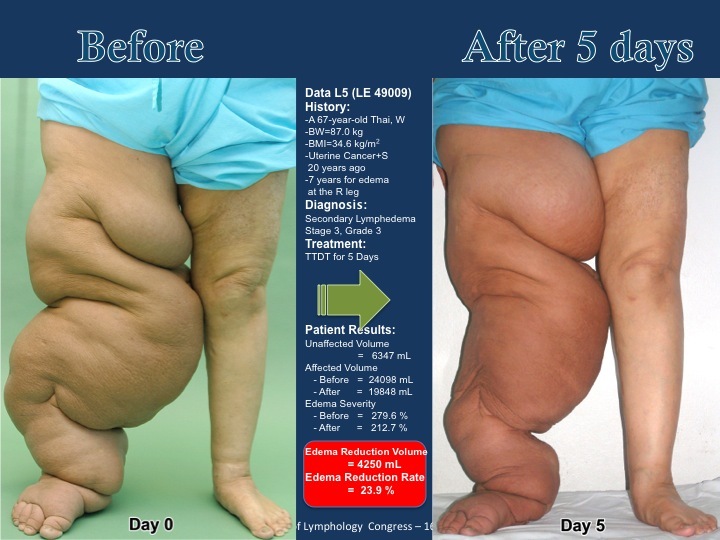 For gigantic lymphedema of upper and lower extremities (severity grade > 100%), an average edema reduction rate was 42.9% and 44.4% that translated into edema reduction volume at 772 mL (range 272~1,789 mL) and 3,458 mL (871~9,191 ml), respectively. 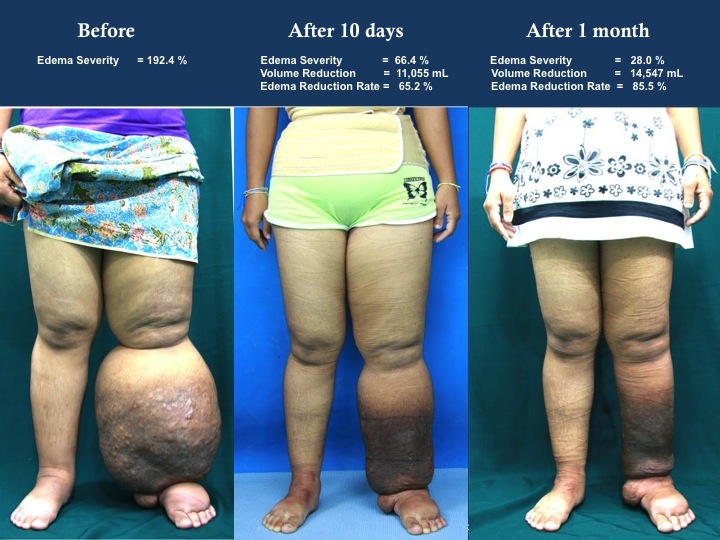 The attractiveness of TTD lies in its simplicity and efficiency, easy to operate and very swift in edema reduction, exhibiting striking results within short days. 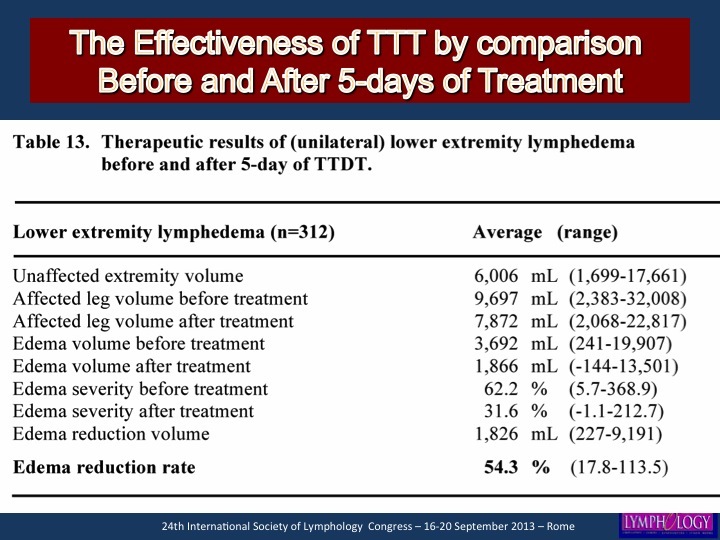 While most treatment protocols are available only at a labor-intensive rate, our TTD is the opposite. 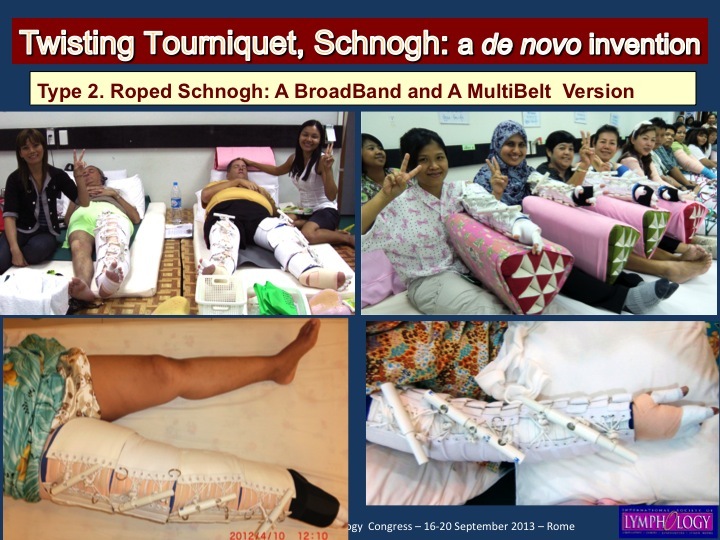 It is totally self-operable. 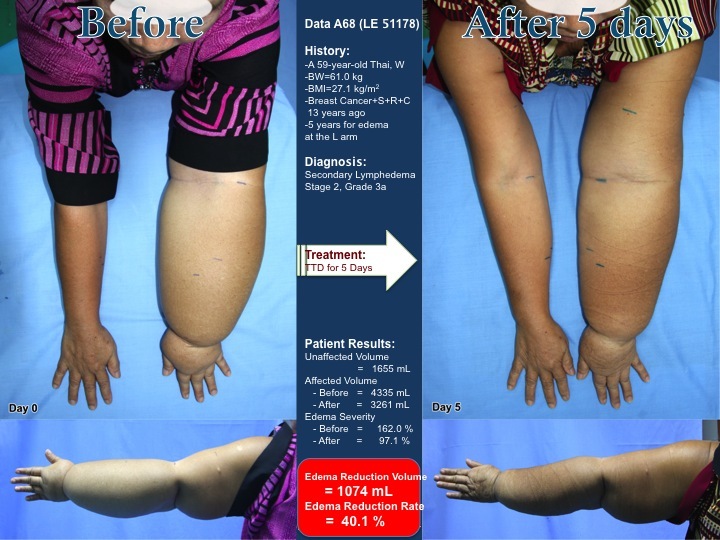 In particular, patients of advanced grades with monstrous lymphedema who present extreme swelling volume of more than 100% to as much as 400%, can easily employ the device at home. 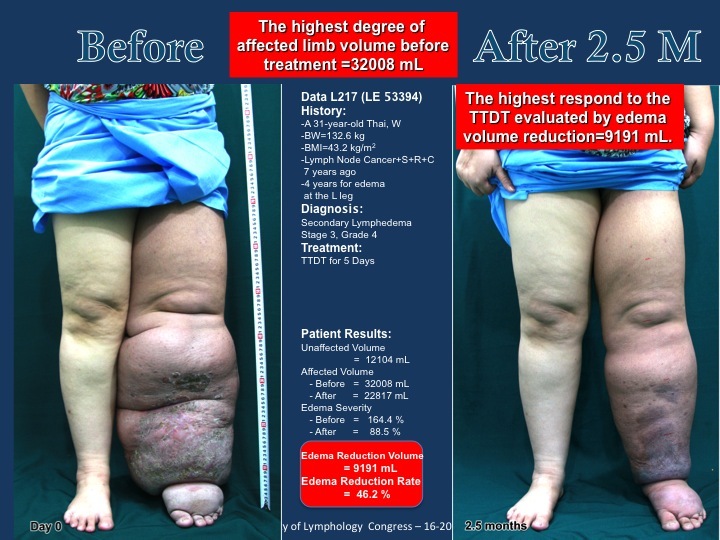 We propose therefore the TTD protocol for routine adoption to those patients with recalcitrant gigantic lymphedema that prevails among the “neglected” population and occasionally in wealthy patients as well.